Hot, dry, remote…for some, the prospect of visiting a place called “Mojave” conjures up an image of a survival exercise in sand and rocks amid unrelenting desolation. But a trip to Mojave National Preserve can be downright civilized, while still offering plenty of possibilities for exploration. As with many adventures, timing is everything, and desert aficionados know that March can be the sweetest month. The days are longer, temperatures are mild, and, if winter rains have fallen, wildflowers paint a rainbow of colors. The interplay of rainfall timing and quantity creates a unique bloom event each spring. 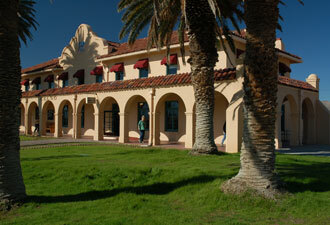 No trip to Mojave would be complete without a visit to Kelso Depot Visitor Center. Built as a train station in 1924, the depot now features exhibits describing both the history of the region and the environmental backdrop where it all occurred. Mining and ranching are among the economic activities that attracted some to make their living here, and the desert shaped the lives of these people just as surely as they altered the desert environment. If you are coming for the wildflowers, some pre-visit research will contribute to a more satisfying visit. Mojave's website offers week-by-week updates on wildflower viewing and leads to desert bloom information across the southwest. When conditions are right, the sandy foothills near Kelso Dunes will produce carpets of desert sand verbena and dunes evening primrose. 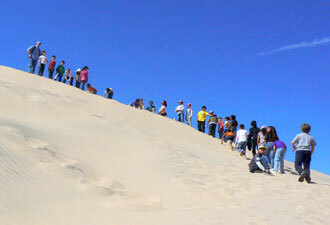 Explore the washes for flowers, then scramble to the top of the dunes for a spectacular view. As you descend, listen for the famous booming sound that moving sands here produce under certain weather conditions. If rain has fallen on the cinder cones and lava beds, hundreds of tiny Biglow monkey flowers lend a purple cast to the dark volcanic soil. Locals call these belly flowers, as they are best photographed lying down! With a high clearance vehicle, you can also visit a lava tube cave—bring a flashlight for this activity. To see the snowball-like blooms of the Joshua tree, try hiking Teutonia Peak Trail, where this signature plant of the Mojave grows in profusion. The climb to the peak lifts you off the desert floor and affords a view of Joshua trees stretching as far as the eye can see. If you are looking for flowers in late April and May, try visiting Hole-in-the Wall. 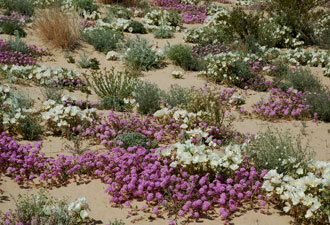 A profusion of desert globe mallow and verbena often covers an area that burned in a massive wildfire in 2005. This is the best area for hikers, with trails leading past petroglyphs, through cactus and yucca gardens and into Banshee Canyon, where you'll discover the holes of Hole-in-the Wall. Campers here enjoy stargazing against one of the darkest night skies in Southern California. Mojave National Preserve is a lesser-known jewel in the California Desert. It's the place to go for everything the desert has to offer—without the crowds!